"Oil prices have risen more than 20 percent since mid-February, despite sizable U.S. crude inventories, as geo-political fears compounded fundamental worries that refiners might struggle to make enough gasoline for the summer driving season." Guess what also happened in mid-February? Total net US petroleum imports started falling. Looking at a slightly bigger picture, 12/30/05 to 4/7/06 (four week running average) we saw a decline of 8.7% (versus an increase in imports for the same time period last year). "A critical point to keep in mind is that an exporter can only export what is left after domestic consumption is satisfied. Consider a simple example, a country producing 2.0 mbpd, consuming 1.0 mbpd and therefore exporting 1.0 mbpd. Let's assume a 25% drop in production over a six year period (which we have seen in the North Sea, which by the way peaked at 52% of Qt) and let's assume a 10% increase in domestic consumption. Production would be 1.5 mbpd. Consumption would be 1.1 mbpd. Net exports would be production (1.5 mbpd) less consumption (1.1 mbpd) = 0.4 mbpd. Therefore, because of a 25% drop in production and because of a 10% increase in domestic consumption, net oil exports from our hypothetical net exporter dropped by 60%, from 1.0 mbpd to 0.4 mbpd, over a six year period.
" We are deeply concerned that the world is probably facing an imminent and catastrophic collapse in net oil export capacity because of declining production and increasing domestic consumption in the top exporting countries. Again, from 2/10/06 to 4/7/06, total net petroleum imports into the US dropped 13.2%, which corresponded to a 20% increase in light, sweet crude oil prices. There is one market for light, sweet crude oil (at least when the US government is not putting oil into the strategic petroleum reserve): refineries. If refiners don't need the imports, why are they bidding up the price of light, sweet crude oil? Consider the simple math. If Deffeyes is correct that the world oil production peaked in December, 2005, then at current rates of consumption, by the time that a first grader, entering the first grade this September, 2006, is ready for the fifth grade in September, 2010, we will have used more than 10% of all remaining conventional crude + condensate reserves. The two "cleanest" HL (Hubbert Linearization) case histories we have are the Lower 48 and the North Sea (see link below for more information). The two principal constraints on production were: (1) they would not produce oil at a loss and (2) fields were generally produced at a rate which would not damage the reservoirs. There were no substantial political problems or constraints on production. The Lower 48 peaked at slightly less than 50% (at 49%) and the North Sea peaked at slightly over 50% (52%). In other words, slightly less than 50% to slightly more than 50%. These were both for crude + condensate Deffeyes estimated that we hit the crude + condensate 50% of Qt mark worldwide in mid-December. The highest crude + condensate EIA number on record was for December, 2005, followed promptly by about a 500,000 bpd drop in January, 2006. It is true that we have relatively high crude oil inventories, but note that we don't know what percentage of crude oil inventories consists of heavy, sour crude, which can't be used in light, sweet crude oil refineries. Also, total product inventories are only up 2.9% year over year. But fundamentally, what does one expect to see at peak production? 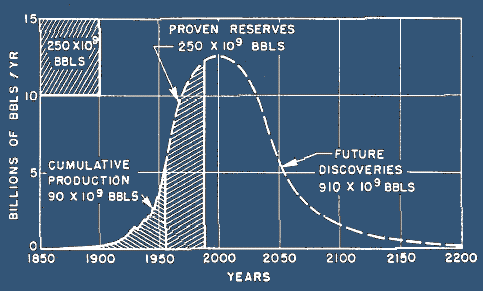 I expect to see peak everything, followed by a permanent and irreversible decline in conventional oil production. The interesting question is why the Mainstream Media (MSM) is not fully reporting the oil story. I think that we are seeing an "Iron Triangle" of sorts defending the status quo: (1) most housing/auto/financing companies and related companies; (2) Most MSM companies that are selling advertising to Group #1 and (3) some major oil companies, major oil exporters and energy analysts that are working for the major oil companies and exporters. In my opinion, Group #3 is afraid of punitive taxation (major oil companies) and military takeovers (exporters). Group #1 wants to keep selling and financing large homes and SUV's. Group #2 wants to keep selling advertising to Group #1. Group #3 provides the arguments for Groups #1 and #2, i.e., we have trillions and trillions of barrels of remaining reserves. One important exception to Group #1: Mike Jackson, the CEO of AutoNation, is calling for a much higher gasoline tax. While this is a start, I recommend a much higher energy tax, offset by tax cuts elsewhere.